Archive or Delete Conversations on Messenger: Here's an article that shows how to archive a conversation in Messenger. 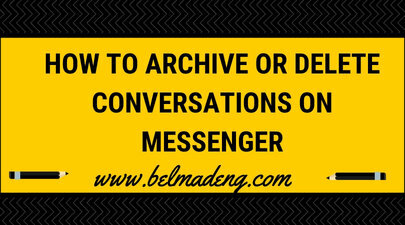 This Belmadeng.com tutorial will also explain the difference between what it means to archive or delete a conversation on Facebook Messenger. So if you are in search of how to archive or delete a conversation on Messenger, this post got you covered. Interestingly, archiving a conversation hides it from your inbox until the next time you chat with that person while deleting a conversation permanently removes the message history from your inbox in Messenger. To see how to delete a conversation on Facebook Messenger, click here. How do I archive a conversation in Messenger? 1. Tap to view your conversations. 2. Tap and hold the conversation you'd like to archive. 2. Press and hold on the conversation you'd like to archive. Note: you can unarchive the conversation and add it back to your inbox by sending the person a new message.